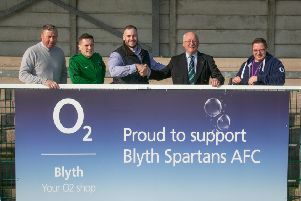 A community football club scored a hat-trick after applying to a Tyneside business to help fund new training equipment. Cramlington United FC has now been able to purchase three training goals after its successful grant bid to Luther Communities Limited. The fast growing club contacted the East Boldon-based community consultation consultancy after hearing about its capital grant fund, which makes awards to local sports projects. And director Joanne Luther, who has already made grants to a dive club and korfball team since launching the fund six months ago, was again happy to help. Cramlington United FC was formed in 2010 by parents of players of Burnside Utd who wanted to join forces with Cramlington Blue Star, offering a place for players to develop their social and physical skills regardless of their footballing ability. Within five seasons it has grown to 29 teams with 340 players aged as young as five through to adult men’s and ladies’ teams. The vast majority of the teams are made up of junior boys’ teams but there are also four girls’ teams and three teams for footballers with disabilities. Each has at least one qualified football coach. Matches are played at Northburn Sports and Community Centre, with training held both there and at various 3G pitches in the area during the winter months. Between the ages of seven and ten most teams play in the Northumberland Mini Soccer League at venues including Walker Dome, Benfield Sports Centre and Cramlington Sporting Club, and aged 11 players start to play home and away on grass pitches. The club is run by a committee of seven, including the chairman, secretary, treasurer, football co-ordinator and welfare officer, supported by 50 volunteer coaches. The dedication and hard work of the founding committee members, led by former chairman Jonathan Buck who recently stood down due to work commitments, resulted in the club being uniquely awarded ‘Charter Standard Community Club’ status by the Football Association in its first 12 months. Another first for a grassroots football club is the partnership with the Teenage Cancer Trust charity, whose name is emblazoned on CUFC shirts. Club chairman Dave Malone said: “We ask members to pay monthly subscriptions to cover the cost of running the club. “All of our staff are volunteers, so any money we make directly benefits the players. “We’re constantly on the lookout for funding opportunities and I’d like to thank Luther Communities for the donation that we have used to help pay for some training goals. Anyone interested in joining the club should contact football co-ordinator Kevin Hastings at info@cramlingtonunitedfc.co.uk and community sports projects interested in applying for capital funding should contact contracts manager Christine Cowans at Luther Communities Limited at enquiries@luthercommunitieslimited.co.uk or visit the website at luthercommunitieslimited.co.uk/community-grants to download an application pack.